Want to experience Alaska’s best wilderness and cultural attractions? 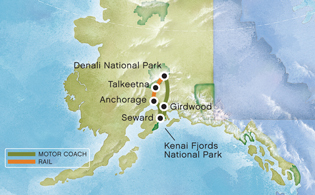 Many are featured on this fully-escorted, 8-day Alaska tour including the Tundra Wilderness Tour of Denali National Park. For added excitement, enjoy an included dinner theatre excursion, an overnight at the Alyeska Resort, a Kenai Fjords National Park cruise and an Anchorage city tour including the Alaska Native Heritage Center and Anchorage Museum at Rasumuson Center. Tour does not include home city air. Extend your Alaska vacation with a variety of Gray Line travel opportunities, or end your Alaska tour here. We’ll transfer you back to the airport and leave you with lasting Alaska memories.